✔ HIGH QUALITY - It is made of environmentally friendly ABS resin and delicately designed. Strong and tenacious which is able to withstand temperatures resistance of -10°C to 90°C. It also non-toxic and odourless. ✔ VERY FUNCTIONAL AND ANTI SLIP - Designed to allow you to cut the bread into 4 different thickness of 1.0cm, 1.5cm, 2.0cm and 2.5cm. 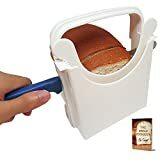 The slicer also comes with 2 rubber paddings, simply paste on the base to prevent the slicer from sliding during usage, suitable for bread to bagels to any pastries. 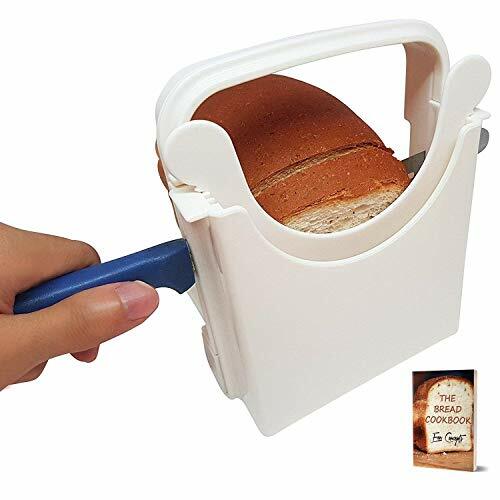 ✔ SIMPLE MECHANISM - Simply slide the divider into the device to choose your desired thickness of your toast or bread. ✔ COMPACT DESIGN - It is foldable, easy-storage and space-saving. ✔ MULTIPURPOSE - Generous slicing surface accommodates bread, toast, bagel, loaf and sandwich. Can also be used to cut ham, cheese and vegetable. Supports loaves up to about 6 inches high and 4.5 inches wide.